It's day 2 of the My Creative Time 5 Days of Christmas, and today I have a fun gift card wallet that I made with a Lori Whitlock file from the Silhouette Online Store. I adorned it with some holly leaves made with dies from Boughs of Holly and used some buttons for the berries. Since I'm putting a gift card in the wallet, I thought it would be fun to make a little card that is the same size as a gift card. I decorated it with some candy cane stripes using one of the Geo Borders stamps. Then I added some more of the holly berry die cuts (I just love those!). Lastly, I pulled out my A Day in December stamp set and stamped the cute circular image with the bell and the fun Naughty/Nice image that is stamped on a little rectangle that I die cut with one of the Square Stitched Goody Dies. Here's a look at the wallet opened up. I used velcro as an enclosure. I first tried some magnetic sheets cut into circles (you can see them underneath), but they weren't strong enough. Luckily my DT sisters came to my rescue with the velcro suggestion! I hope you enjoy our 5 Days of Christmas and AMAZING GIVEAWAYS! Emma has put together some of HER favorite "MUST HAVES" for the giveaways this week! To qualify for a chance to win, you will need to comment on each blog and (very important) leave an email for us to contact you if YOU are the LUCKY winner! You will have the ENTIRE week to leave your comments! Emma will announce all of the winners on Monday, December 8, 2014, on her blog! Good luck everybody! What a super cute gift idea!!! OMG What a Fun & Fab gift card idea you really did an outstanding creative job with it too....love how you used Miss Emma's goodies as well. Yep the velcro idea is a great one too. YOU ROCK!! What a cute gift card wallet!!!!! Love it!!!! little magnets that work perfect with these kind of projects! I use them on my little purses! What a super cute idea. I love the matching card! Great idea...FAB FAB FAB wallet!!! That is a beautiful gift idea! Love the wallet. This turned out so awesome! GREAT idea! This is amazing, how clever!!! love it, lauraluvslace@gmail. The wallet is a great cut file and you decorated it so pretty...love the embossing and the buttons as berries too. The stripe and Nice sentiment is so cute on the card. Great job! A gift card and beautiful packaging--perfect! So cute - love the wallet. 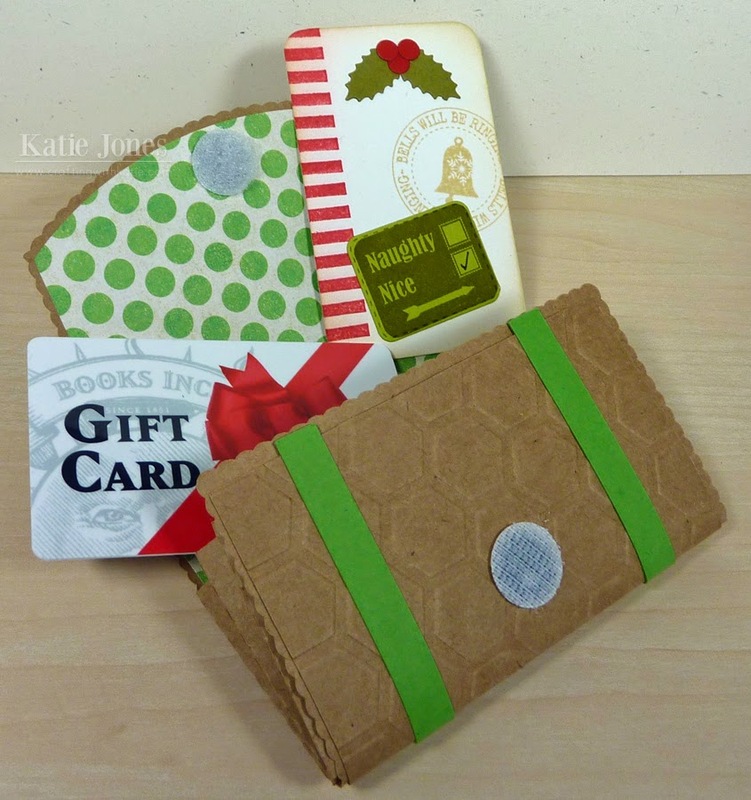 A wonderful way to present gift cards! Inspired and inspiring! Super fun wallet and love the embossing! I am sure anyone would love receiving this! What a fun wallet! Great job! Super fun way to give a gift card. What a cleaver way to give a gift card, also love the little card that goes with it. Such a cute idea!! Love this. Very cool gift card holder! Clever idea for a gift card. TFS! Cute wallet! Love the embossing, and the extra touches you used. And the Velcro is safer than magnets, in case there are little ones or pets in the home of the recipient. :) TFS! Fun wallet! I love the embossing and the little details with the holly leaves and the card inside! Thanks so much for sharing! This looks amazing! I love the texture and the cute little details you added! This turned out AMAZING!!!! What a GREAT gift idea Katie!!! LOVE it!!!! Wow! What an awesome wallet and clever idea! I LOVE it! Oh My how cute... the wallet is awesome plus your adorable card to match the same size as GC to tuck inside... awesome! The wallet is so pretty - looks like leather. Love the embellishments and the gift card. Katie ~ Oh my word how FABULOUS and PERFECT and STUNNING is this idea! I LOVE it! Okay first of all making the wallet and a gift card is CLEVER but then adding another little decorative one ~ looks like that persons wallet is full of LOVE! FABULOUS idea! Of course I LOVE the papers and details too! Oh this is the perfect gift card holder. Thanks for sharing. Your wallet turned out beautiful! This is so awesome!! I love it!! Hugs!! I love crafts that look like the real thing so this might be my fav! Love the wallet and love how you decorated it. 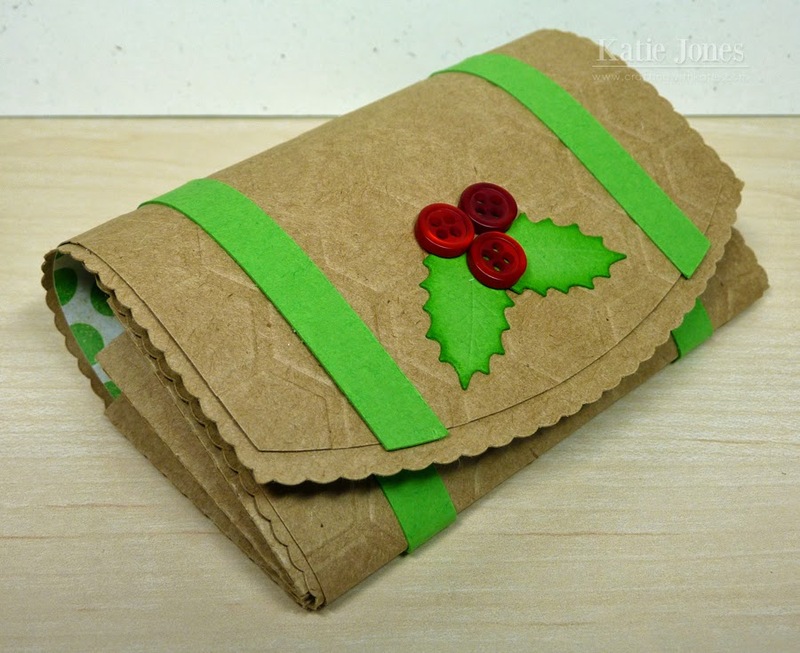 Love the idea of a gift card wallet! Super cute, by the way!